We supply bifold doors at trade prices to traders, developers and property development companies, we can also supply bulk orders for customers/businesses with multiple developments. If you’re a property owner or have a property portfolio and require bifold doors for multiple properties, we can work with you to supply in bulk. Bifold Doors UK manufactures and supplies quality and high-performance bifolding doors for UK trade customers. If you want to maximise your space, visually as well as physically, folding doors could be the answer. As one of the UK’s top manufacturers and suppliers of bifold doors made of aluminium, timber, hardwood and more, we understand the needs of architects, builders, installers and specifiers. We work alongside our clients to make sure they have the technical information and support that require before, during and after the installation is finished. From large commercial applications to an easy door replacement, we can handle any project and can deliver a high-spec product to your site, quickly. Our doors are manufactured to the highest standards in a range of beautiful hardwood materials with an assortment of colours and woodgrains/stains available. You can be sure our trade products are of exceptionally high quality. Bigger is better when it comes to Bifold doors, we can supply on demand, which is convenient for many property developers, home renovators, architects and individuals/businesses associated with property improvements/renovation. 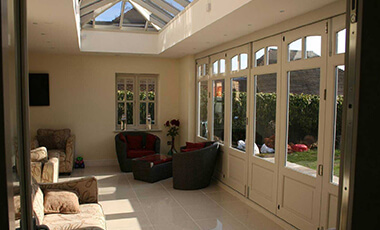 Need a quick quote for bi-fold doors? Use our online enquiry form or give us a call on 0843 886 8378. Our doors are perfect for installers, architects and builders looking to identify bi-folds to order, or use as a design tool to help customers envisage how the final product will look. We can supply trade bifold door kits ready for installation, we’ll also deliver anywhere in mainland UK so if you have bifold door requirements we’ll be able to help. You can find out more about the pricing below for products however for trade price queries please contact us to discuss.